The Almond Flower: Yay! We're Having a Baby! Boy! Yay! We're Having a Baby! Boy! Our little baby is due at the end of October and we found out last week that it's a BOY! I wanted a girl because I'm pretty girly and calm myself, and I really wanted to buy cute dresses and bonnets and play tea party. Boys play with weapons, and get dirty, cause a ruckus and smell. But you know of course I feel so so so happy, excited and lucky to grow a little baby and to be the mother of a boy. I love the kids I teach at school and I've known them now for a few years. Seeing them grow, watching how they treat other students, and listening to how they talk with their friends has been amazing. Kids are so cute and awesome and I'll be so lucky if our child turns out anything like the kids I've known. 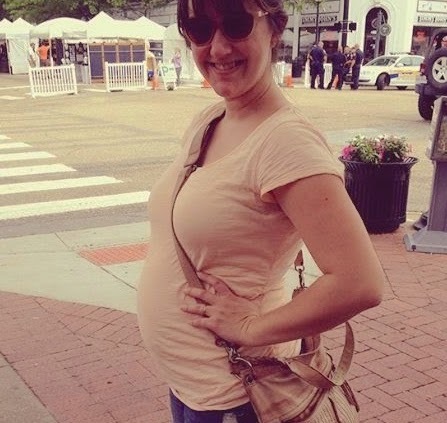 As for pregnancy, I'm feeling pretty even keeled and normal about it all. I don't have a lot of uncomfortable symptoms, my belly's still pretty small, I don't feel all wacked out from hormones (yet). We'll see, of course, how I feel in the fall when I'm huge, wearing TOMS and leggings everyday and starting out the craziness of a new school year. I have started to feel him move (it's also really fun to say "him" instead of "it") and that has been pretty great. For me, I've always wanted to have a baby and be pregnant. I think pregnancy is so amazing and weird. That a woman's body grows this tiny little thing into a real baby and then accommodates to push it out. So crazy! I'm trying to drink enough water, get enough sleep, take a lot of walks, cuddle up with my dog, and be calm and peaceful with this thing I'm growing and generally just experience and appreciate my first pregnancy with my first baby for what it is. "Is it a girl, is it a boy, is it both!?" They hug me goodbye and then say, "by baby". Everyday. "Can I rub your belly?" "Um, your belly's getting big, you look like you're having a baby." And from the 5th graders, "We kind of figured. No offense but you're kind of getting bigger." A whole Kindergarten class erupted in applause when I told them I was pregnant. "But where is the baby?" "The baby's really small and then it gets bigger, and then it comes out. And then your belly's still kind of big. My mom's still trying to make her belly smaller." From a more advanced 5th grader, "Yeah...I know how the baby comes out." I said I was really hungry and a 4th grader said, "You ate your baby!"